August 15, 2017 - New Yorker Electronics will be releasing a new series of Vishay vPolyTan™ multi-anode polymer surface-mount chip capacitors that delivers increased volumetric efficiency for computing, telecom and industrial applications. A 2017 Vishay Super 12 Featured Product, it combines polymer tantalum technology with Vishay’s patented multi-array packaging (MAP) to deliver the industry’s highest capacitance density with best-in-class ESR. Available in the molded EE (7343-43) case code, these capacitors offer up to 25% better volumetric efficiency than similar devices, which allows for higher capacitance and voltage ratings. For example, their capacitance of 150µF at 30V is three times higher in capacitance than the closest competing device. They also offer a capacitance tolerance of ±20% and overvoltage ratings up to 75V. The advanced packaging of the T59 series ensures ultra-low ESR from 25mΩ to 150mΩ at +25°C and 100kHz. By replacing multiple lower-capacitance devices, T59 series capacitors reduce component counts to save PCB space and lower costs in solid-state drives, networking equipment and motherboards. 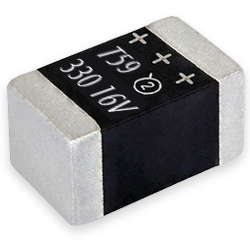 In these products, the capacitors are intended for decoupling, smoothing, filtering and energy storage applications. The T59 series features ripple current from 1.3A to 3.1A at 100kHz and an operating temperature range of -55°C to +105°C. The capacitors are 100% surge current tested to ensure robust performance in high-inrush-current applications. RoHS-compliant, halogen-free and Vishay Green, they are made in both lead (Pb)-free and tin/lead (Sn/Pb) wraparound terminations. They are also available in tape-and-reel. New Yorker Electronics is a franchise distributor for Vishay and carries the full line of 2017 Vishay Super 12 Featured Products as well as its complete line of discrete semiconductors (diodes, MOSFETs and infrared optoelectronics) and passive electronic components (resistors, inductors and capacitors).